Day 254: To be Clear. As a Woman and As a Mother, I DO NOT support military action by the United States in Syria. I just read the statement above that was made by House Speaker John Boehner, the one where he says he supports President Obama’s call for military action in Syria. This is no big surprise because I mean this is always the solution we choose isn’t it? I mean seriously, it’s time to Follow the Money Trail to see who it is that stands to profit from war in Syria. The question is: Why are we claiming to care about what’s happening in Syria when we don’t care about the 30,000+ children who die daily from starvation throughout our World? And, Who will Profit most in a war against Syria? These are just a few of the questions that must be answered. So, to be Clear. As a Woman and as a mother, I DO NOT support military action by the United States in Syria. I mean I understand what has been reported as going on in Syria as chemical warfare. But the truth is, if I put myself in the shoes of another, if I lived in Syria, I would not want another country like the United States blasting their way in to assist me. This is Not the kind of support I would be looking for. Not military support. The past military actions by the United States speak for themself in that of all the effort by the United States via military support, has only proved deadlier than the initial reason for going to war in the first place. War is not a means to an end. That sort of logic means that more blood will be shed. More people die and this is a fact that is no longer acceptable. It doesn’t make sense to risk more life while we continue to spend money on a war that gives support to the Major Corporations – when clearly we cannot afford to keep making the rich richer while the rest of us remain poor. There are other solutions/choices that we can come together and investigate. This Is the sort of commitment that I am supportive of. The only choice valid will be one that does not cause harm in any way. Study what’s going on in Syria and study the history of us as the war we have been. Study the increase in Poverty and Starvation. Ask yourself if you’re Willing to Stop Supporting such a continued path of destruction. I Commit myself to Support Solutions that will cause No Harm in any way to anyone. Study the Solution with us @ Desteni and investigate Basic Income Guaranteed. “I forgive myself that I have accepted and allowed myself to refuse to realize and see that mind-power, as it exists in the Matrix, is just clever designs to try and manipulate and benefit from the abusive, destructive money system while staying in self-justification, blind to what is caused in the image and likeness of consciousness. I commit myself to assist each one willing to become equal as the box of the mind to be able to create self as life here without getting lost in the dimensions of energy that is the Trap of the Mind-Protection Design. Large crowds formed outside the White House to celebrate, singing "The Star-Spangled Banner" and "We Are the Champions." President Barack Obama announced Sunday night in a televised news conference : "Osama bin Laden, the Saudi extremist whose al-Qaida terrorist organization killed more than 3,000 people in coordinated attacks on the U.S. on Sept. 11, 2001, is dead, and U.S. has recovered his body. This is why large crowds were formed outside the White House to celebrate – because of death. I don’t know for sure whether Osama bin Laden was directly responsible for what he has been accused of. And I don’t know how any of us can be sure of anything until we have first investigated ourselves. There are so many within our world who are struggling and barely surviving, and plenty who are dying with no assistance whatsoever, where no one even knows there name. We accept and allow wars and senseless killings daily and we avoid seeing the blood of others upon our own hands. We are being led to follow those who have the power of money in their pockets . And we party as if we have accomplished something, when there is nothing to celebrate. There is not ‘One Man’ guilty, ‘We as a World are all Guilty’, according to what we accept and allow instead of seeing for ourselves what the hell we are participating within and as. How have we come to celebrate death? Let’s be honest, we continue to nail people to a cross, to bare the burden of what we choose to not see existing within ourselves… I sat in silence and breathed as tears ran down my face for us all, for what we’ve all become. We have to stop. 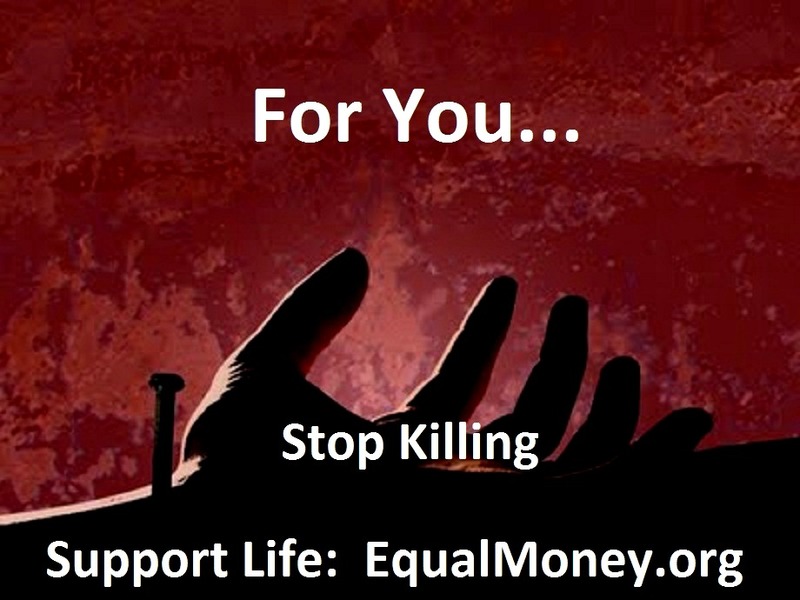 We have to Stand Up and take Self-Responsibility in Self-Honesty and say, ‘Enough, No more killing’. Instead – We Stand Up for All, and we support a Real Solution, an Equal Money System and World Equality. To bring about a World where all life lives in dignity, free from greed and corruption. Only then, when the Solution of Equality is here, will we have something to celebrate. This entry was posted on May 2, 2011, in Uncategorized and tagged Abbottabad, al Qaeda, Barack Obama, Bin Laden Dead, chingaone.blogspot.com, Colorado Springs Gazette, Equal Money System, Fox News, Metro Weekly, NorthEscambia.com, Obama, Osama, Osama Bin Laden Dead, Osama Bin-Laden, Osama Dead, Pakistan, President Obama, United States, United States Congress Video, White House, world equality, World News.